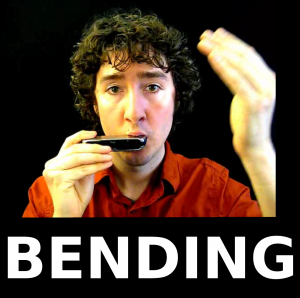 If you can play clear single notes, you can learn how to bend! The lesson begins with an explanation of what it means to “bend notes,” a survey of which notes on the harmonica can be bent, and performance examples of all draw and blow bends. I also provide a quick review of the single-note pucker technique, a basic skill you need in order to get farther with bending. When teaching my harmonica students how to bend, I try to provide options for different learning styles by offering two approaches: an intuitive, descriptive approach, and a more detail-oriented, technical approach. However you get there, once the basic technique is established, we move on to exercises and musical examples which build the skills you need to bend notes in all musical styles, whether you play blues, folk, jazz, Celtic or rock. This downloadable harmonica lesson on bending focuses mainly on draw bends, but also covers blow bending. Most students need to master draw bending before working on blow bending, but when you’re ready, this introduction will get you started. Please remember: you need to be able to play clear single notes in order to get the most out of this lesson. International Customers – prices are listed here in US Dollars, but when you purchase, your credit card or Paypal will be charged the equivalent amount in your own currency.